To be effective, a bird netting installation must be well planned and properly installed. The following guidelines provide a basic outline designed to help you plan for a bird netting installation. Each installation is different and some steps may not apply to your application. If you have questions or need help, please Contact Nixalite. 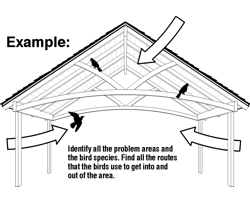 To get a hardcopy of these steps, download the Planning A Bird Net Installation page. For more information on bird netting applications, download the Netting Application Examples. For dormer and eave installation examples, download the Eaves & Dormer Netting Examples. Identify ALL the places birds land, roost and nest. Identify the bird species. Find ALL the entry and exit routes birds use to get into and out of the area. You must find all of them or birds may be able to get behind the installed bird netting. The netting should either enclose the problem area or block off all the routes that birds use to gain access to the area. 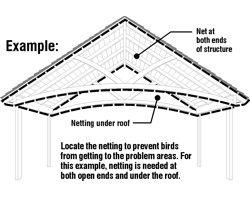 For the example shown, netting is needed at both open ends as well as under the roof. Plan the path of the netting carefully. Keep the netting away from conditions that could damage it such as moving objects, high heat, equipment, etc. Some objects and surfaces require periodic maintenance or attention. You can change the netting path to exclude these areas, or enclose them and use the Net Zipper to gain access after the netting is installed. Accurately measure where the bird netting will be installed. If the path of the planned installation changes elevation (up or down), make sure to account for this in your measurements. Do not base netting estimates on ‘square footage’. This is seldom accurate as it does not allow for any vertical (up or down) changes in the netting path. Accurately measure and record the location of any beams, pipes, joists or any other objects that could serve as additional support for the bird netting. Some small problem areas may end up outside the netting enclosure. For these surfaces, use the Nixalite Stainless Steel Bird Control Strips. PollyNet Lightweight: Ultra-light construction. Use for installations where low visibility andeconomy are more important than longevity. 3/4x5/8” mesh. Low cost. PollyNet Premium: Tough, seamless construction. Used for all bird netting applications. 1/2" square mesh stops large and small birds. Economical netting, Resists UV. K-Net HT: Heavy-duty knotted, multi-strand bird net. Used for all bird netting applications. Ideal for long term use in harsh environments. 3/4” mesh stops most birds. Review your installation measurements. From the Netting Coverage Tables below, select the netting sizes or combination of sizes that will provide the needed coverage. ALWAYS allow extra netting. The Netting Coverage Table lists the best coverage from each netting piece while still allowing for perimeter and seam fastening. Netting Coverage Tables - Use listed Coverage size when estimating for the amount of bird netting required. The following describes a few of the netting hardware systems available from Nixalite of America Inc. Choose the hardware that best suits your application. For more information, refer to Bird Netting Hardware and Accessories. Poly Hardware - Economical and easy-to-install netting hardware made from UV stabilized polypropylene. For all types of netting. Tensioned Cable Hardware - Strongest and longest lasting net hardware. A rock solid cable system to which any netting can be fastened. Bird Netting Accessories and Tools - Nixalite offers a variety of tools and accessories to make the netting installation process faster and easier. Perimeter & Support Cable System Design:A tensioned cable system supports bird netting from the outside edges (perimeter support) and if needed, in the interior of the installation (support cables). For most installations this support system consists of a simple square or rectangular pattern of cables that can measure up to amaximum of 50 feet long and 50 feet wide. Support cables are used when there is minimal overhead support. Bird netting should NOT be allowed to run more than 50 feet without support cables. We recommend installing support cables every 25 feet. 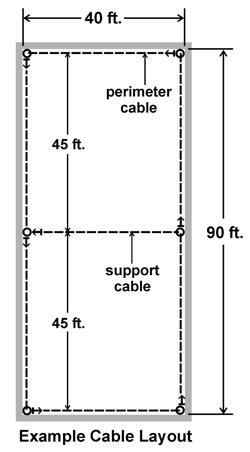 Example: an area that measures 40' x 90' would have a minimum cable pattern of two grids or squares, both measuring 40' wide and 45' long. At the 45' mark, a support cable would run across the 40' width. This would provide the recommended fastening for the netting at the mid-point of the span. This size span could be covered with a K-Net 50'x100' or 2 - K-Net 50'x50's. It would take 4 - 14'x100's to cover this space with PollyNet Premium Bird Netting. Nixalite of America Inc recommends installing all bird netting with netting hardware and accessories. We offer these items because they are proven reliable and can fasten the bird netting to nearly any surface. However, it is not the only way to fasten bird netting. The following PDF file shows ‘additional methods’ that can be used to fasten bird netting. Common construction materials can be used to install bird netting. These methods of installation are constructed and customized to fit on-site. To download this page of examples, go to Additional Netting Installation Methods. Custom Applications - If you are not sure what to use, Contact Nixalite. We can recommend an installation method suited just for your application. There are many different ways to install bird netting but the goals of the installation should always be the same: no gaps, openings, wrinkles or excessive net sag.